Mihai Tripp, a journalism student at Southern Connecticut State University, reported this story as part of Journalism Capstone coursework on World War I. The majority of names on the New Haven World War I monument are from the 102nd division, also known as the Yankee division, according to Laura Macaluso, the author of the book “New Haven in World War I” (April 2017). One of three city monuments, the memorial on the New Haven Green includes a flagpole, a water fountain, along with the names of those that served from New Haven. A short distance away, is the oldest city monument, the Yale WWI memorial was built in 1928, just one year before the city of New Haven built its own. It honors the Yale students who fought. The Timothy Ahern Doughboy Statue is located at the corner of Ella Grasso Boulevard and Derby Avenue. “No one really remembers that statue today. It is sad. It is quite lovely of a statue,” Macaluso said. The monument on the green includes the names of 20 servicemen from the city who died in one battle on one day, April 20, 1918. They were part of the C & D company of the 23rd Regiment of the 102nd Infantry. Macaluso said she is concerned about the fact that many people have no knowledge about the monuments. Macaluso is not, in her definition, a war historian or even a war buff. She started writing based on an art perspective. A graduate of Southern Connecticut State University, where she tripled majored in English, Italian and Art, she later went on to study art at Salva Regina University in Newport, R.I.
She started to work with the city of New Haven to look at the art in the city to take pictures and write about it for the city website. Along the way she became interested in WWI. “There are connections between monuments that people don’t realize,” Macaluso said. 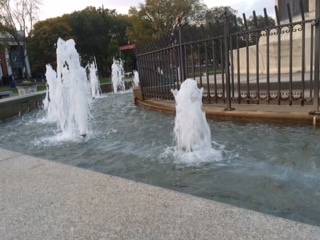 For example, the fountain at the New Haven Green monument was not part of the original design. “The fountain was put in to mark the bicentennial of the New Haven reservoir, the relationship between water and the city. It has nothing to do with WWI,” she said. Macaluso said the city of New Haven needs to step up education and upkeep of the memorials. She would love to see the city add interactive elements to the monuments either via a website or app. She worries acid rain, smog and poor upkeep might mean the monuments other than at Yale might continue to deteriorate. To see a full list of names on the monument, click here to open a PDF file. Dear Mihai, Thank you for your article. Sorry to hear no one in CT remembers the Ahearn statue today. His family and others in the local Irish community are very proud of his heroic actions during WWI as a 1st generation Irish American. Perhaps one of the history students could explore the role of the Irish, or other immigrant groups from CT, in service during WWI. It would be very timely, given the anti-immigrant views espoused by some of our leaders.